This series is my first Fantasy project. As I’ve said in the About Dave page, I collect Fantasy novels. I was introduced to the genre by my eldest son who recommended Stephen Donaldson’s first and second “Chronicles of Thomas Covenant”. I bought all six books just before a December holiday and was declared “missing in action” for the whole holiday. I couldn’t put the books down and have read them at least three more times since. After these books I was hooked and moved on to Tolkein then Terry Brookes and David Eddings. 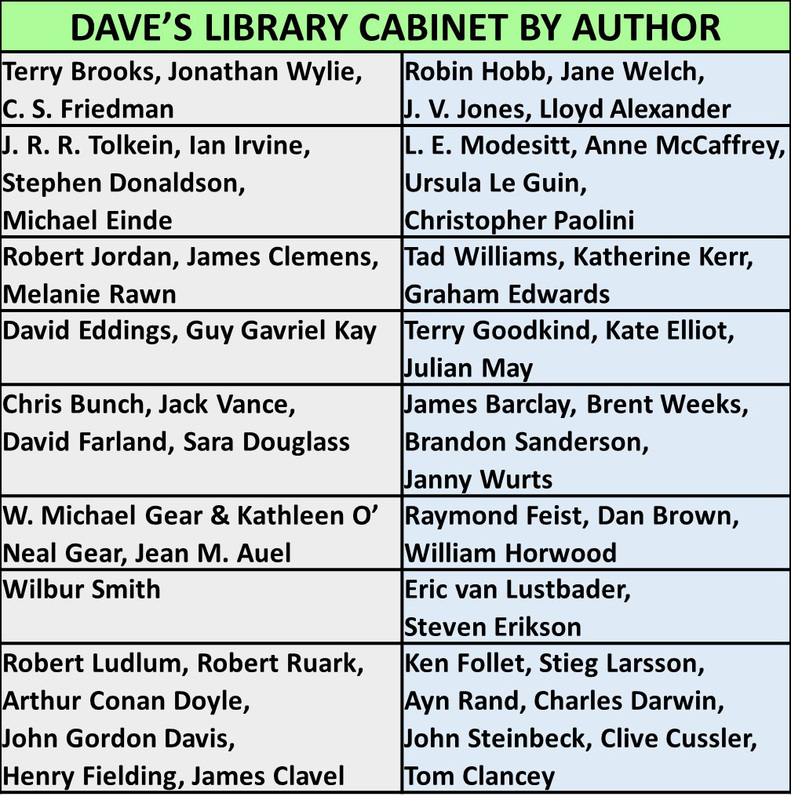 I have developed a strong following for several fantasy authors since then and you can see who they are in my Library Cabinet. I was very sad when my family downsized to a smaller home and I had to give away half of my collection. Given this love for fantasy stories, it isn’t really surprising that I would want to do a project in this genre. I had a few ideas in my head and during the same period that I visited London to market my thriller I started a fantasy story. As mentioned elsewhere, I had just been retrenched and so was ‘unemployed’ and looking for a job. This was in June 2000. In the end, I was out of work for three months and, in that time, I had substantially drafted the first two books in the series. This coincided with the revisions to the thriller trilogy and was interrupted by the new job and the next retrenchment. I only completed that first draft in the December 2001 holidays once I was unemployed again. My activities from then until 2015 have been covered elsewhere so suffice it to say that my fantasy remained dormant for fourteen years until I revisited it at the same time as I was working on the Big Data books and dusting off the thrillers. The fantasy series is called “The Creator’s Egg” and it owes inspiration to several “Creation” myths and legends from a number of primitive peoples around the world. It also has an explanation for “out of body experiences” and the myths and legends of “Angels”, which are a fundamental part of certain world religions. The series is an epic fantasy thriller, full of quests, journeys, mystery, intrigue, action, adventure, excitement and global war. The series is set in Opteria, a planet where birds (avians) evolved to a position of dominance in place of the mammals on Earth. These avians are bipedal and have arms with well-developed hands, as well as wings. They have full powers of speech and are fully as intelligent as humans. They are indeed, the Angels of Opteria. When the planet is threatened with global war, salvation may rest on the arrival of an alien savior, who must recover and bond with three ancient talismans. If he is successful he may gain the powers needed to resist the invaders. The series is true fantasy in the mold of Tolkein and Stephen Donaldson. For more information I have published a Prequel to the series. It is a free book so download it today. This prequel is not essential to your enjoyment of the series. But, if you are a true fantasy lover, you will want to add this book to your collection. In this first book of the series, Falco – leader of the Fallons – begins to experience dreams of alien intervention in his world. At the same time, he is faced with the biggest threat in his civilization’s history. No fewer than four armies are massing at the periphery of the central continents of the world of Opteria. His dreams are disturbing, and too real to be mere fictions of his imagination. In his attempts to understand their portent, he turns to the body of Myth and Prophecy that has become fundamental to the beliefs and values of his people. He finds that central to these Myths and Prophecies are the recurring themes of an alien savior and the power of the Creator’s Egg – an ancient artefact imbued with magical capabilities that have the power to harness natural forces and the supernatural in defense of the races of Opteria. Supporting the Egg are two other Talismans – The Swords of Freedom that must be wielded by a master of skills long lost to the world, and the Orb of Truth that provides insights, visions and abilities to attack and defend against oppressors. Unfortunately, these Talismans were lost at the end of the Avian Wars of antiquity – a conflict that nearly destroyed Opteria. As Falco tussles with his dreams and starts to consider his own destiny, Falland is invaded, and the possibility of global war again menaces the peoples of the world. The team had hoped that, as the last known protectors of the fabled weapons, the Struthions would be able to point the way to the weapons. Their hopes are dashed since the “Old Ones” admit that they and their race have lost the swords and have no ideas how to find them again. Using legends and prophecies as the only clues and supported by the considerable knowledge of the ancient Struthions, a search begins for the fabled weapons. The quest is long, complicated and arduous, with many dangers along the way and the invaders are developing new tactics against the searchers all the time. To make things worse the wars are not going well and the need for the power of the artefacts increases all the time. There are two pressing questions. Will the Swords ever be found? And, just as important, will they be found in time? After the triumphant mission to recover the Swords of Freedom, Hesh and the support group travel, as fast as they can, back to Lyde where Falco has established the Fallon Headquarters. Hesh has bonded with the Swords and is keen to turn his attention to the second of the three Talismans – The Orb of Truth. However, due to pressures of the wars, on all fronts, Hesh has to focus on short term strategies and tactics to slow up the progress of the invaders and push them back if possible. Only after survival of the allies is assured, for the time being, can the stranger turn his attention to the search for the Orb of Truth. His first task is to decipher the Scroll found with the Swords of Freedom. This gives a starting point for his search for the second Talisman. Hesh and his support group encounter many challenges, dangers and puzzles in this quest, which takes them through two continents. Finally, Hesh must accept a daunting challenge, and the result of the quest depends entirely on whether he can overcome this ultimate hurdle. The Orb has been recovered and its protectors included into the Fallon leadership. The watcher has a copy of an ancient document that pinpoints the ‘ends of the world’ to the invader homelands. So, the good news is that the approximate locations of the four shards are now known. The bad news is that all four are surrounded by enemies. Hesh is delayed from starting his quests for the shards, by short term issues relating to the wars. The allies decide they need better information on the invaders’ intentions. Hesh begins spying missions that provide prior knowledge of enemy strategies and tactics. This intelligence helps the allies to react better to the threats they face. Finally the alien is able to turn his mind to finding the shards. He realizes that the Strig protectors must have left messages to guide those trying to find them and hits on a strategy to find the messages. Because he has visited Sphen, he decides to seek the shard there first. In the meantime, Hesh is busy helping to build alliances with other races and also has to foil a plan to kill him. Finally, he is now actively working on a plan to end the wars, sooner rather than later. With all this on his plate, the stranger is stretched thin. But, if he manages to retrieve the first shard, he fully intends to immediately start the search for the second one. Since his arrival on Opteria, Hesh, the alien stranger has recovered the Swords of Freedom the Orb of Truth and two of the four hidden shards of the broken Creator’s Egg. He has also successfully initiated many tactics and new weapons that have kept the allies alive, and not losing the wars. But the allies are not winning either, Every time they seem to be getting ahead, the invaders, in the four main continents, react and come back stronger. Hesh has also realized that he must not only win the wars, he must also win the peace. In the final book of the series, Hesh faces the challenges of finding the remaining shards to reform the Egg, then coming to terms with the bond between himself and the Talismans and, finally, he must figure out how to win the wars without destroying the planet. Only once these things have been achieved will he have any chance of shaping and winning the peace. If all that wasn’t enough, he must also come to terms with his own doubts, fears and homesickness. And one final thing – the significance of the main image on this page will only become apparent if you read the story!